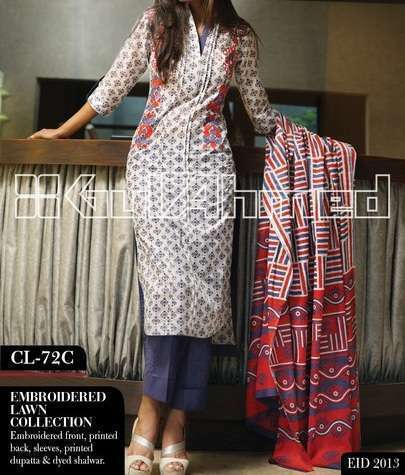 Gul Ahmed is one of the finest brands in women’s wear category. The stuff Gul Ahmed provides is very tempting and it gives an amazing touch to the femininity that enhances the beauty and elegance of your personality. Especially if we talk about the Lawn collection, Gul Ahmed has always provided very fine designs embedded on extremely delicate fabric. Gul Ahmed claims to provide the “original lawn”, and I personally think they claim it right! The latest Festive Eid Collection by Gul Ahmed is yet another beautiful step for the elegant ladies. The variety and versatility of the collection gives you a lot of options to select from. There are a lot of categories in this collection. And each category holds many designs, prints, and patterns from which you can select the best looking one depending upon your likes and dislikes. Imagine your self in any of these dresses and opt for the one that will suit you the best. As the Eid-ul-Fitr is closest on the calender, Gul Ahmed is an excellent choice for this event as the Summer is at it’s peak. Hence you need a dress that is comfortable and cool along with being trendy and graceful. The various categories in Gul Ahmed’s latest collection are discussed briefly here. There is a simple lawn collection offered by Gul Ahmed. These are for those who want to opt for lawn considering the hot weather conditions. It includes EMBROIDERED LAWN, SINGLE LAWN, and NORMAL LAWN. For those who can tolerate Chiffon in this weather has more better options. The collections include chiffon touch in dresses. Some may contain chiffon duppatas and some may have chiffon patches and ad-ons for your dress. 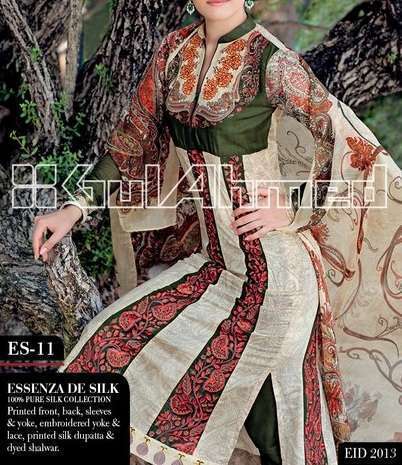 This collection include CHANTILLY DE CHIFFON, LA CHIFFON, and PREMIUM EMBROIDERED CHIFFON. Well if you want to ignore the extremity of weather and want to choose a dress that will give you the touch of formal dressing; DIGITAL SILK and ESSENZA DE SILK is the right choice for you. The prints, colors, and embroidery patterns used in this collection is very great and eye catching. The combinations are soothing and give you very fine feel. So in my opinion, Gul Ahmed Eid Collection 2013 is the best choice for making your Eid great! You can visit your closest Gul Ahmed outlet or order it online here. You can also check the latest collection on the Gul Ahmed’s Facebook page.